1. Rainfall Probability Distribution Analysis in Selected Lateral Command Area of Upper Krishna Project (Karnataka), India, by N.K. Rajeshkumar.- 2. Analyzing Rainfall and Reservoir Release Pattern for Ajwa Reservoir – A Case Study, by Pushkar Sharma.- 3. Preliminary Investigations on Localized Rainfall Interception Losses Under Real Field Observations, by M. L. Gaur.- 4. Probabilistic Estimation of Design Daily Runoff from Bamhani Watershed, India by Sarita Gajbhiye Meshram.- 5. Development of Generalized Higher-Oder Neural Network Based Models for Estimating Pan Evaporation, by Sirisha Adamala.- 6. Sensitivity Analysis of FAO-56 Penman-Monteith Reference Evapotranspiration Estimates Using Monte-Carlo Simulations, by Gicy M. Kovoor.- 7. Quantification of Error in Estimation of Reference Crop Evapotranspiration by Class A Pan and its Correction, by S. Praharaj.- 8. Spatial and Temporal Analyses of Impervious Surface Area on Hydrological Regime of Urban Watersheds, by Tauseef A. Ansari.- 9. An Assessment of Hydrological Impacts Due to Changes in the Urban Sprawl in Bhopal City and ITS Peripheral Urban-Rural Fringe, by L Patel.- 10. Simulation of Urban Drainage System Using Disaggregated Rainfall Data, by Vinay Ashok Rangari.- 11. Investigation of Drainage for Structures, Lithology and Priority (Flood & Landslide) Assessment Using Geospatial Technology, J&K NW Himalaya, by Umair Ali.- 12. 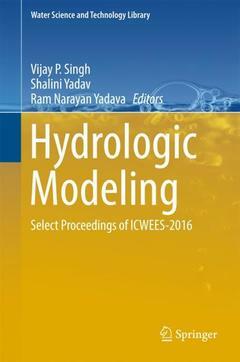 Hydrologic Design Parameters Database for Water Harvesting Structures in Madhya Pradesh, by Ramadhar Singh.- 13. Application of Storm Water Management Model to an Urban Catchment, by V Swathi.- 14. A Study of Erosional Depositional Activity and Land Use Mapping of Majuli River Island Using Landsat Data, by Dipsikha Devi.- 15. Study of Soil Erosion and Deposition Around an Island in a Natural Stream, by Snighdhadip Ghosh.- 16. Impact Assessment of Alternate Land Cover and Management Practices on Soil Erosion: A Case Study, by T.R. Nayak.- 17. Geostatistical Analysis of River Sedimentation Behaviour in Kerala State, by Mathew K. Jose.- 18. Study of Mineralogical composition of sediment in Brahmaputra River in Urban stretch of Guwahati city, Assam, India, by Mamata Das.- 19. Hypsometric Analysis for Assessing Erosion Status of Watershed Using Geographical Information System, by S.K. Sharma.- 20. Assessment of Different Bathymetry Statistical Models Usinglandsat-8 Multispectral Images, by Omar Makboul.- 21. Estimation of Minimum and Maximum Air Temperature using MODIS Remote Sensing Imagery and Geographical Information System (GIS), by Sardhara Bharatkumar.- 22. A RS & GIS Approach for Estimation of Runoff and Soil Erosion in SA-13 Watershed, by H. N. Bhange.- 22. Rainwater Harvesting Structure Site Suitability Using Remote Sensing and GIS, by B.K Gavit.- 23. Land Surface Temperature Estimation Using Remote Sensing Data, by Vijay Solanky.- 24. Watershed Prioritization of Wardha River Basin, Maharashtra India Using Morphometric Parameters: A Remote Sensing and GIS Based Approach, by B. S. Manjare.- 25. Flood Assessment of Lolab Valley from Watershed Analysis Using Remote Sensing and GIS Techniques, by Mannan Bashir Wani.- 26. Delineation of Paleo-Channels in Periyar River Basin of Kerala Using Remote Sensing and Electrical Resistivity Methods by C P Proju.- 27. Application Of Eo-1 Hyperion Data For Mapping And Discrimination Of Agricultural Crops.- 28. Morpho-Mathematical Analysis of Bharar River Basin District Chhatarpur-Central India, by Pradeep Kumar Jain.- 29. Application of Principal Component Analysis for Grouping of Morphometric Parameters and Prioritization of Watershed by Sarita Gajbhiye Meshram.- 30. Velocity Distribution in Vortex Chamber at High Water Abstraction Ratio, by Mohammad Athar.- 31. Performance Appraisal of Friction Factor Estimators, by Abhishek Mishra.- 32. Experimental Investigations of Wave Height Attenuation by Submerged Artificial Vegetation by Beena Mary John.- 33. Developing Rating Curves for Nubia Lake, Sudan, Using RS/GIS, by Mohamed Elsahabi.- 34. A Spreadsheet Approach for Prediction of Rating Curve Parameters, by Javel Alam.- 35. Experimental Study on Role of Emergent Artificial Coastal Vegetation in Controlling Wave Run Up, by Beena Mary John.- 36. Development of Regional Soil Water Retention (SWR) Characteristics, by R. K. Jaiswal.- 37. Revision of Empirical Coefficients of Commonly Used Flood Formulae Using Flow Data from Karnataka Rivers, by Chandramohan T.- 38. Reservoir Inflow Forecasting Using Extreme Learning Machines, by Mukesh Kumar Tiwari.- 39. Quantifying Discontinuity, Connectivity, Variability, and Hierarchy in Overland Flow Generation: Comparison of Different Modeling Methods, by Xuefeng Chu.- 40. Nondimensional UH Based Smoothing of S-Curve Derived UH Oscillations, by P.R. Patil.- 41. Fuzzy-based Comprehensive Evaluation of Environmental Flow Alteration, by Kairong Lin.- 42. Spatial Characters of a Tropical River Basin, Southwest Coast of India, by Girish Gopinath.- 43. Streamflow Estimation Using SWAT Model Over Seonath River Basin, Chhattisgarh, India, by Sabyasachi Swain.- 44. Revisiting the Soil Conservation Service Curve Number Method, by S.K. Mishra.- 45. Hydrological Impacts of Rejuvenating Degraded Hilly Watershed in Shivalik Region by A.K. Tiwari.- 46. Modelling of a River Basin Using SWAT Model by B. Venkatesh.- 47. Performance of The Xinanjiang Model by Ajay Ahirwar.